Every so often you get to step outside of your comfort zone and do something Different. How often do you actually get to drive a car through a UN World Heritage Site? The view you get here is when you're driving South to Key West on US1 the Overseas Highway. Despite the fact that its bogged down with far too many people that are doing just the same thing it is an amazing drive. At this point, the border of Monroe County is just ahead of the car, the entry sign is just on the right hand of the frame and those buildings are in The Keys. The road itself is not my favorite. Its suffering wear and tear of too many cars, washboarded in spots, potholes to the last surface below it worn in others. Driving a Jeep Wrangler you get used to a ride that is not exactly soft. But from this spot, it is another 115 or so miles to my destination and each of them bears watching for diverse hazards. There are many stretches of bad road, construction and a road bed that is too narrow for the use it's been given. There are also crocodiles, key deer, and pelicans. The pelicans are the only thing I've seen close up, and just barely missed having the inside of my car painted by one on the Seven Mile Bridge. The picture above is much nicer than the one on street view in Google Earth. That one when I look at it as of this writing is during construction, but it is linked below. It is an older picture on Google Earth, and the view is much improved since the road construction has moved South. You can zoom out and see for yourself how much further I had that day. It may be a somewhat ugly strip of asphalt but look left or right and you are in an unparalleled one of a kind slice of beauty. The people in the Keys can paint their buildings pastels, put up signs proclaiming that they're in paradise and try to sell it to you as you drive past with the kids screaming to buy shells, but they have nothing on the natural beauty there. 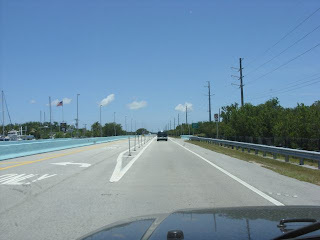 The road is a mess, it is 106 miles from Key Largo to Key West plus the 16 mile causeway back to the Mainland, but the land it traverses is well worth looking at. The Keys are absolutely beautiful, yes, the road needs serious work. Will it ever get completed/completely done, I doubt it.